The Personal Responsibility and Work Opportunity Reconciliation Act of 1996 (Public Law 104-193) directs the Social Security Administration (SSA) to report annually to the President and to the Congress on the status of the Supplemental Security Income (SSI) program. Projections of program recipients and costs through at least 25 years are required elements of these reports. This report is the 20th of such reports. The SSI program is a nationwide Federal assistance program administered by SSA that guarantees a minimum level of income for aged, blind, or disabled individuals. It acts as a safety net for individuals who have limited resources and little or no Social Security or other income. 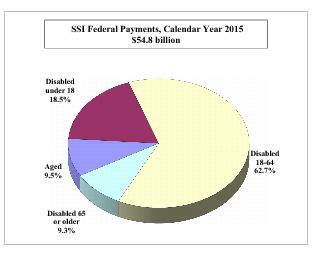 In January 2016, 8.152 million individuals received monthly Federal SSI payments averaging $526, a small decrease of 3 thousand recipients from the 8.155 million recipients with an average payment of $526 in January 2015. Federal expenditures for cash payments under the SSI program during calendar year 2015 increased 1.2 percent to $54.8 billion, while the funds made available to administer the SSI program in fiscal year 2015 increased 6.8 percent to $4.3 billion. In 2014, the corresponding program and administrative expenditures were $54.2 billion and $4.1 billion, respectively. By 2040, the end of the 25-year projection period, we estimate that the Federal SSI recipient population will reach 9.1 million. The projected growth in the SSI program over the 25-year period is largely due to the overall growth in the U.S. population, though the growth in the SSI recipient population is projected to be somewhat slower than the growth in the U.S. population. As a percentage of the total U.S. population, the number of Federal SSI recipients decreased slightly from 2.51 percent in 2014 to 2.48 percent in 2015. We project this percentage to gradually decline throughout the 25-year projection period, reaching 2.29 percent of the population in 2040. We estimate that Federal expenditures for SSI payments in calendar year 2016 will increase by $0.1 billion to $55.0 billion, an increase of 0.3 percent from 2015 levels. In dollars adjusted by the Consumer Price Index to 2016 levels, we project that Federal expenditures for SSI payments will increase to $60.6 billion in 2040, a real increase of 0.4 percent per year. Federal SSI expenditures expressed as a percentage of the Gross Domestic Product (GDP) were 0.31 percent in 2015. We project that expenditures as a percentage of GDP will decrease to 0.29 percent of GDP in 2016, and continue to decline thereafter to 0.20 percent of GDP by 2040.